If I’m called on to cook any sort of fancy or special meal for a few people then there’s a pretty good chance that the starter will be a meze-style selection of dips and other little dishes. That’s partly because I can make them in advance but it’s also because that’s just the way I like to eat. I often use peppers in dips and this particular version has developed a stronger flavour over time. It started out as vaguely North African, then suffered a bit of Spanish influence and now has a hint of Mexico, I suppose. I don’t use green peppers very often in cooking – I’m really not that fond of them - but in this dish the sour qualities are essential. 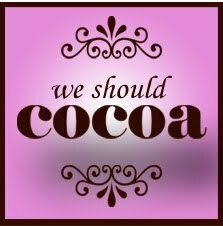 Choclette of Chocolate Log Blog has set an interesting task for the February We Should Cocoa challenge: a savoury, vegetarian dish including chocolate. So this should fit the bill. You could add some chillies for heat and other flavours such as garlic or more spices. They would work in this dip, but I prefer the purer flavour of peppers, especially since I’d probably serve hotter and spicier dishes alongside it. Softer, salty cheeses such as feta also work really well with the intense pepper flavour. Since this dip is strongly flavoured you may not need to serve very much, especially if combined with other dishes, so this amount should serve 6 or more. Fry the onion very slowly in a little oil until it’s completely soft and starting to caramelise. Add the roughly chopped peppers, the cumin, paprika and the tomatoes. Season and simmer the mixture gently for 30 – 40 minutes. Allow to cool a little before the next stage. Toast the almonds lightly in a dry frying pan, place in a blender and process briefly. Add the tomato and pepper mixture and process until smooth. Pour back into the pan, heat gently and stir in the maple syrup. Gradually grate in the chocolate, stirring and tasting as you go. Stop adding the chocolate when the flavour is suitably intense – the chocolate is there to intensify the flavour and not to make the dish taste of chocolate. Cool and refrigerate until needed. Ideally, allow the dip to come to room temperature before serving and decorate with the reserved pepper pieces. 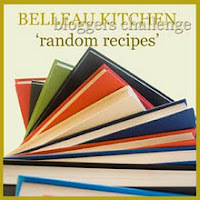 The Random Recipe challenge hosted by Dom over at Belleau Kitchen has reached its first birthday and for this anniversary challenge Dom has asked us to return to the book we used for the first ever event. For me that was the ‘The Cuisine of Alain Senderens’. I have huge admiration and respect for M Senderens, mostly for his masterly cuisine but also because he had the courage to tell the Michelin guide he didn’t really want his three stars any more. On the other hand, finding a recipe that would be suitable for the challenge wasn’t easy, partly because we’re trying to eat a little less fat around here at the moment and partly because we’re not rich. The recipes in this particular book take no prisoners. They include a lot of cream and butter as well as plenty of lobster, turbot, oysters and frog’s legs. Eventually, after a few random attempts, I came across this dish, although I confess that I’ve simplified the recipe and reduced the fat a little. The result is simple but, happily, very tasty. You need to start this dish the day before you want to eat it to allow time for the marinade to work. This will serve 2. Squeeze the juice from the oranges and lemons. Peel the garlic cloves, crush them in a pestle and mortar with the oregano and mix into the orange and lemon juice. Season the pork, pour over the juice mixture, cover and place in the fridge for at least 12 hours. The next day, drain the pork thoroughly, reserving the marinade. Peel and deseed the tomatoes and chop the flesh quite finely. Use a cloth or plenty of kitchen paper to dry the pork (it’s important to do this thoroughly) and fry the meat in a large pan with a little olive oil for around 5 minutes. Remove the pork from the pan and pour away any excess fat. Add the marinade and let it reduce by about half. Add the tomatoes, the stock, the bay leaf and the thyme. Return the pork to the pan, bring to a simmer, cover the pan and let it cook gently for 35 – 40 minutes until the pork is very tender. At this point, you could simply remove the bay leaf and serve the pork in its sauce, but I prefer to remove the pork and allow the sauce to cool before skimming off any fat. Check the seasoning and add a little honey if the sauce tastes a bit too sharp. Reheat the pork in the sauce before serving. I think this is best served with plain rice to soak up the strongly flavoured sauce. If you’re longing for some sunshine or need a little cheering up, then I can definitely recommend this cake. To me, it tastes like pure sunshine in cake form – moist, crumbly, buttery and very lemony. It’s based on a recipe by Salvatore De Riso, the celebrated pastry chef and baker from the Amalfi coast. You may well have your own method of making candied peel but, briefly, here’s what I do. Remove just the yellow peel (not the pith) with a vegetable peeler and add it to a pan of cold water. Bring the pan to a boil, remove the peel and discard the water. Repeat the boiling process two more times and then simmer the peel in a strong sugar syrup (roughly 2 parts sugar to 1 part water) for 10 minutes or so until the peel is transparent. (If you do include more of the pith, then it will take longer). Toss the peel lightly in caster sugar once it’s cold and store it in an airtight container until needed. Serve this cake with coffee or as a dessert and, if you’re anything like me, feel instantly happier from the first mouthful. Preheat the oven to 160°C. Butter and line a 20 cm round cake tin or, if you’re like me, just use a silicone mould. Cream the icing sugar and butter together thoroughly. Briefly mix in the lemon zest, candied peel and vanilla paste and then gradually stir in the eggs. Mix in the flour, baking powder, and potato flour. Add half of the ground almonds and stir in gently. Add half of the milk and do the same. Repeat with the remainder of the ground almonds and the milk. Put the mixture into the prepared tin and level it. Bake for 40 – 45 minutes. A knifepoint should come out clean when the cake is ready. Let the cake cool down in the tin before removing it. Dust the top of the cake with icing sugar if you feel so inclined. I'm entering this post in a new blogging challenge starting this month - Alphabakes hosted by Ros from The More Than Occasional Baker (the host for February's challenge) and Caroline from Caroline Makes. Each month a random letter of the alphabet is selected and the challenge is to bake with an ingredient starting with that letter. Happily this month's letter is L and that says lemons to me.